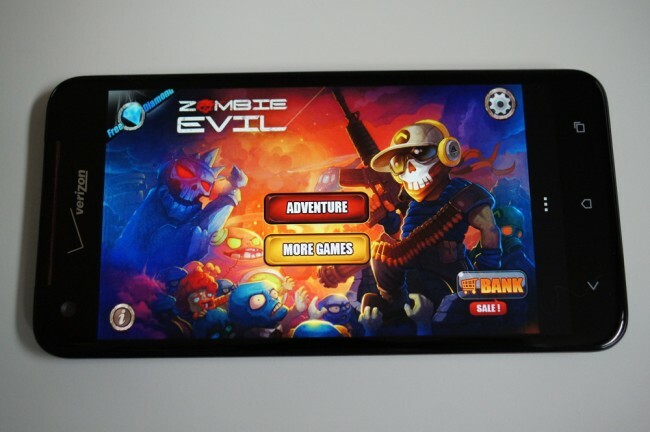 Last night, while cruising through the up-and-coming games section in the Goole Play store, I noticed a rising entry called Zombie Evil and decided to give it a shot. After playing it for a few minutes, the only things I could think to compare it to were tower defense titles and Plants vs. Zombies. It’s a fantastic mix of the two, in that you have waves of bad guys that will overtake you unless you strategy is good enough. As with any zombie game, you are the hero trying to save the rest of the world from a full-on zombie takeover. You sit behind a wall with a handful of guns that you get to unload upon waves of zombies. There are bad bosses, fat zombies that explode, rapid zombie dogs, shotguns, bombs, power-ups, and money. As you advance and get more coinage, you can buy better defenses, new guns, power-ups, etc. It’s free, and you can certainly win by being patient. But like most free games with in-app purchases, your life is much easier and the game can be beat much quicker if you fork out some cash. Early December Release Set For Nexus 7 Dock From ASUS?